Dr. KC Wenning is a proud Jersey Shore native, having grown up in Shrewsbury, New Jersey. He graduated from the College of the Holy Cross, and received his dental degree from Rutgers School of Dental Medicine. He completed a general practice residency in dentistry at Hartford Hospital in Hartford, Connecticut. Dr. Wenning performs all phases of dentistry including cosmetic, prosthetic, implant, and restorative dentistry. 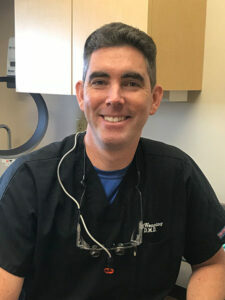 He is involved in community service, having volunteered his time and services to Mission of Mercy, Give Gives a Smile, and Donated Dental Services, which provides complimentary dental care services to those with no other access to dental care. In his time away from the office, you can find Dr. Wenning enjoying a round of golf, ballroom dancing, and traveling.